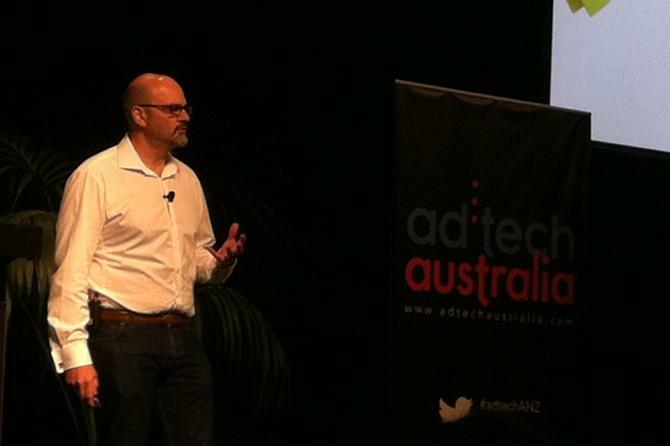 Owen Rogers speaking at today's ad:tech event at the Hilton, Sydney. Focusing on the human element of design is crucial if organisations want to drive innovation and growth, the senior partner of one of the world’s leading design houses, claims. Speaking at the ad:tech event in Sydney, Owen Rogers discussed the importance of factoring in the human element of design, which he feels is too often overlooked by businesses. Rogers emphasised the need of building to think, instead of thinking to build, and the creation and impact of “ideas with long tales”. IDEO also worked with the Singaporean government and its Ministry of Manpower to improve processes for people becoming citizens, which Rogers claimed had been arduous previously. Key to improving experience was redesigning the department building to make the process more efficient and family friendly, as well as overhauling follow-up communication to be more direct and engaging. “The only thing that Singapore has is people, they have no natural resources… so it was trying to figure out how they were going to leverage that so they were attractive to people,” said Rogers. Each of these changes has a lasting impact, or what Rogers labelled “ideas with long tales”. He cited the work of Louis Pasteur, known for his work in pasteurisation, off the back of which he created the Pasteur Institute, through which many eminent scientists, medical breakthroughs and Nobel prizes have been won. Rogers also told the story of Caine’s Arcade, in which a young underprivileged boy created his own game arcade out of discarded cardboard boxes at his father’s auto-shop. After a video about Caine went viral, created by his first customer, the play arcade received several thousand visitors, and a fundraiser was started to help his parents afford to send him to college. This fuelled the creation of the Imagination Foundation to encourage kids to build and create in order to ensure the future. Today, the program has nearly 86,000 participants in 46 countries. In order to come up with the best and most lasting ideas, Rogers advocated design thinking, which he described as an “incredibly intuitive” process that can drive innovation. Creative confidence is also important, and is something organisations need more of given so many adults have been conditioned to not think creatively, he claimed. One key element of design thinking is brainstorming, where the rules should always be to defer judgement, build on the ideas of others, encourage wild ideas, and stay focused on the topic. It’s also important to be visual. “It’s not good enough to just shout your ideas out,” Rogers said. When brainstorming ideas, Rogers recommended going for quantity, not quality.